The Hungarian cheesy noodles is one of the best Hungarian foods for beginner cooks. If you want to feel the success fast and you want to have a great and tasty food within couple of minutes (maximum 30 minutes) this is a great choice. The cheesy noodles is good in itself or as garnish for Catfish paprika. What kind of ingredients do you need? Bring a large pot of lightly-salted water to a boil. 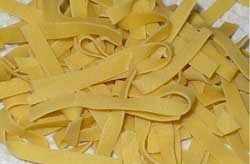 Add pasta and cook it for 8 to 10 minutes, when it is ready drain well. If you want to avoid sticking the noodles together put a little oil in the boiling water. In the meantime, while the pasta is cooking. Dice the smoked bacon on small cubes and fry them until crisp. After the bacon is ready, bring them out from the backing-dish and set aside. Mix two tablespoon sour cream into the grease and add the drained noodles. Stir the sour cream with the noodles. Before you spoon the cottage cheese evenly over the top of the noodle mixture, check the temperature of the noodle. If it is not hot, heat it up. 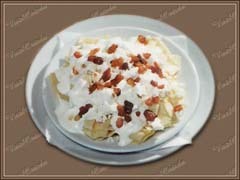 Add the rest of the sour cream and sprinkle the crumbled bacon over the top; season with salt. There are some people who like to bake the cheesy noodles. If you decide to try out this variation. Preheat oven to 175 degrees C (350 degrees F). Bake until the cottage cheese softens, 3 to 5 minutes. And here we are. The Hungarian cheesy noodles is ready. I hope your first Hungarian cheesy noodles was a great success. I’m always happy to hear about your success stories, so please share it with me. If you have questions or you have some problems with the recipes, please contact us and we will help you.